Big changes are happening at Florida Agricultural and Mechanical University. NOVA is assisting with FAMU Way, Phase II which entails a new east-west roadway between the current end of FAMU Way at Wahnish Way and Lake Bradford Road. 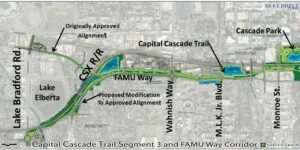 Also, the Capital Cascades Trail project that will serve as a complement to the City’s extension of FAMU Way, which includes the construction of a multi-use trail, playground, bicycle/pedestrian walkways and many other amenities that will run alongside FAMU Way. Local NOVA crews are providing construction materials testing for all mentioned above.